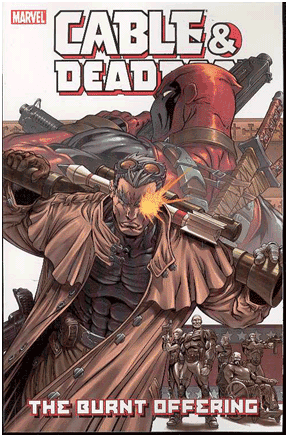 CABLE & DEADPOOL — Marvel's Finest Moment? Bonjour folks. It is this time of the year again when I talk to you about strange things and yell at my closet for not washing the dishes. It is time for CABLE & DEADPOOL. A few years ago I stumbled over a trade called IF LOOKS COULD KILL. Fabian Nicieza was writing this little gem, and we had a nice little roulette of artists doing duty on this title, but Patrick Zircher is the only one who did over 20 issues. But whatever. I´m here to talk about the book. Creators can come later. Let me give you a little summary. Cable, also known as Nathan Dayspring Askani'son Summers, is on top of his powers. He is literally bursting with it. His telekinetic powers are nearly limitless and his telepathy allows him to scan the whole world at once, without using Cerebro. The soldier from the future is on a quest, and the quest is not easy. But as the first issue begins, he has to learn that not everyone is playing nice or willing to play with him. Wade Wilson, the Merc with a Mouth whom we all know as Deadpool, has been contacted by the One World Church to steal a new virus and deliver it to their enclave in France. The virus is called "the Facade Virus" as it allows to reprogram the DNA of the infected to change their looks. As it is, Cable is after this virus too, to prevent that it falls into the wrong hands (and Deadpool's hands are always the wrong hands). The first arc, IF LOOKS COULD KILL, sets the stage for everything to come, as Deadpool manages to deliver the virus and, surprisingly, joins the One World Church. Cable, trying to figure out what to do with his nigh limitless powers, infiltrates the church to observe the plans of the Church with the virus, which is fairly simple: to turn the skin of every human on the planet blue. Why? To erase racism, to bring mankind together as one race. For Cable, this is unacceptable and he tries to stop the process and to bring the virus under his control, only to be confronted by a blue-skinned, nonscarred Deadpool, a true believer of the Church. In the course of the battle, Cable is infected with the virus himself and loses the control over the techno-organic virus in him and he and Deadpool have to join their DNA to save both of them. This results in one of the best story devices EVER! Every time Cable uses his teleportation matrix, Deadpool is teleported with him, thanks to the DNA exchange, also giving Deadpool the ability to teleport to Cable's position with the words "Landslide by one" or "Landslide by two". After putting himself together and leaving Deadpool in France, Cable prepares his endgame by transmitting the virus worldwide and giving everyone pink skin instead of blue, and achieves what he wanted, unifying the world for a brief time. This puts him on the map of every nation and S.H.I.E.L.D., when he created the floating city of Providence out of the wreck of Greymalkin, his old space station. This marks the beginning of my all-time favorite storyline: THE BURNT OFFERING, which was originally known as THE PASSION OF THE CABLE. Deadpool is hired to steal several pieces of technology from around the world to put together a doohickey to stop Cable. But someone else is already ahead of him assembling the parts: Shen Kuei, aka The Cat, a master thief for the highest bidder. All this is necessary as Cable threatens the world to throw all their weapons in the sun if they do not dismantle them. Refugees arrive at Providence by the thousands, seeking out a new life away from greed and restriction, making Providence a thinktank for peace and innovation and alternative lifestyles. Uniting the world against him, Cable and the opposing players start to take positions. Scott Summers (Cyclops), the father of Cable, who sent him to the future to save his life from the techno-organic virus and ultimately is responsible for transforming him to the ultimate soldier, is vowing that the first line of defense against Cable will be the X-Men, and that if they should fall, there is no shortage of people willing to try. 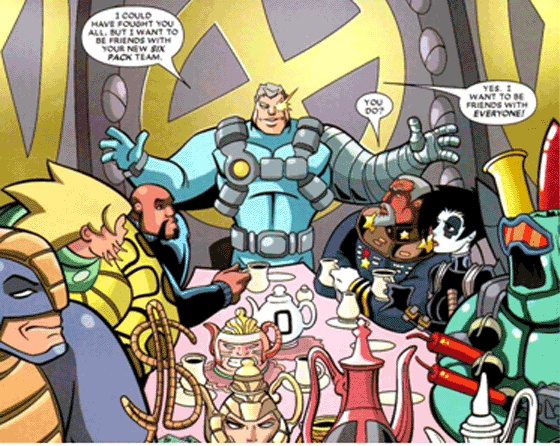 The X-Men take in Deadpool after he attempts to steal another piece of the device and manage to use his connection to Cable's teleportation matrix to enter Providence undetected. But they are not the first to arrive. The Six-Pack has already been sent in to scout the situation and was easily defeated by Cable. With the X-Men arriving to stop Cable, everything turns upside down when Deadpool betrays them and joins forces with his new gen-buddy to help him survive the upcoming onslaught. Deadpool is still trying to get his hands on the weapon/device that is meant to defeat Cable, only to find an unsuspected ally in The Cat, who helps him in defeating Cyclops and putting together the thingamabob. Meanwhile, the world governments bring in their wild card: the Silver Surfer, called by Reed Richards to bring down Cable before he can pull the world into chaos. This is one of the best fights in the last 20 years: a power-bursting Cable against a quiet but determined Surfer, who believes that Cable's hunger equals the hunger of his former master, GALACTUS. 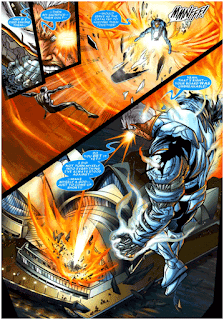 Cable nearly defeats the Surfer and even destroys his board, but in the end, the strain of the fight, their destroying nearly all of Providence while Cable is putting everything back together while still fighting, is enough to bring Cable down. This marks the point where the secret plan of Cable comes into play. The device assembled by Deadpool is designed to teleport out of his head the portion of his brain that is responsible for his increasing powers. These powers are slowly burning out Cable's body and mind, and everything he has done up to this point was to use his powers before dying to give mankind a glimpse of peace. He was taking away the pain of the world via his telepathy and shared his thoughts with the whole world. Deadpool then does the unthinkable and lobotomizes Cable. 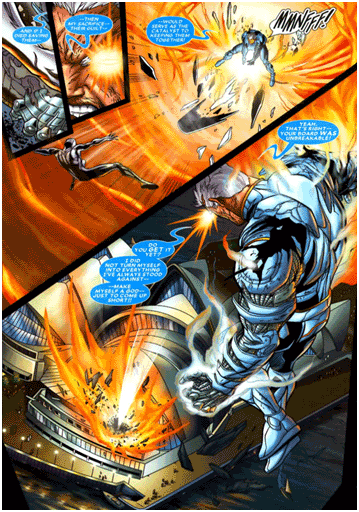 Cable's last words are published as an interview with Irene Merryweather, and he himself vanishes. So ends the first metaplot of the series. Pretty cool, hmm? Now let's get to the real thing — what makes this series so amazing, and one of the best Marvel has ever published. Nicieza's style combines the serious and sometimes ruthless Cable with the insane and moralless Deadpool. He does this by slowly rubbing off the character traits of one to the other and make them more on equal footing. For the first time in his life, Deadpool has a goal that is not money and someone who believes in him just as he believes in what Cable is doing. We see a more mature Wade who is protecting Cable and fighting for the idea of one man who has seen the future. 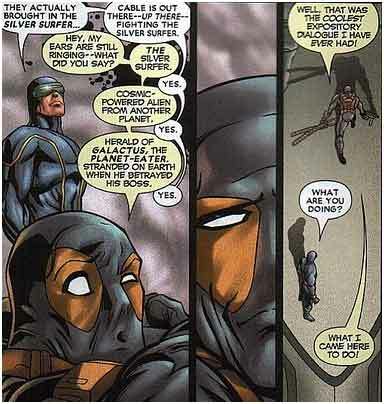 Nicieza creates some very strong Deadpool moments, like when Deadpool is trying to get Cyclops to trust his son. Or his amazing expository dialogue. Deadpool is torn in between being a soldier of fortune and the vision of a friend, between his old nature and a new world. You will never see a Deadpool like this again, or better. Up to now, we haven't seen one. Cable on the other hand is built up as, maybe, the metahuman messiah, putting his life on the line to create a finer world and to help humanity to realize that change is necessary. In the same moment, he is the target of Deadpool's jokes and indulges over time in the banter. He becomes more human and also more like a benevolent god that is looking out for its children. The ridiculous display of huge guns he is associated with from the times of Mr Liefeld is made fun of and vanished in the background as his powers increase and will stay there for a long time as he finds his replacement powers after his "accident" at end of THE BURNT OFFERING. This book made me love Cable as one of the most interesting characters Marvel has to offer, if done right, and is also the excuse for anything Liefeld has done, at least in my book. I love Cable! The series unfolds later on in a metaplot that has Cable and Deadpool struggle with their roles in the world and the plans that were made. Nicieza is literally going on a tour de force with the reader, throwing in guest stars from the X-Men to S.H.I.E.L.D. and Cap and the Six Pack. We get Luke Cage and Iron Fist in one of the most hilarious stories involving Weasel, the B.A.D. girls, and a chase scene that made me wet myself ... multiple times. Also included are visits to the Age of Apocalypse and other parallel universes, as well as the CIVIL WAR tie-ins and Mike Carey's X-MEN make a brief appearance. New characters a created and, of course, never to be heard of outside this series. Oh, and Bob, Agent of HYDRA, is in there too! The art is on a stable level and ranges between average and pretty good, without excelling into the higher reaches of the medium. I haven't even noticed the change of pencilers during my reading. The story just absorbs you and makes everything else just an extension of Nicieza's run. Don't get me wrong, art is important to a comic book, but some books are just different and move beyond the point where the art is an "active" factor. The styles of the different artists are all fitting for the stories that are told and help you to read the books without a break in storytelling, which I credit to Nicieza, as he is the only constant on the run. A recap page can be found in each book, narrated normally by Deadpool himself, but he is occasionally sharing it with guest recappers like The Horsemen of Apocalypse and other in-story characters. Of course, the recap page is not the only instance of 4th-wall-breaking going on. 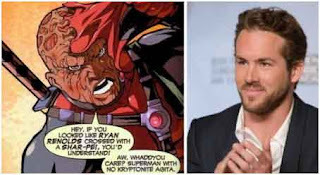 Deadpool breaks the wall every other issue with remarkable results like him referring to looking like Ryan Reynolds years before X-Men Origins: Wolverine or him making fun of the demasking of Spider-Man, wondering what the issue is as they all know he looks like Tobey Maguire. Okay, let me wrap this up. You want a book that is a fun read? Here it is. You want a book with a compelling and engaging story? Here it is. You like/love Cable or Deadpool? There you go, you won't find an author today that is showing so much love for those two fringe characters as Nicieza does. Epicness and fights? All in there. What can I say? I love this series. And I can read it over and over and over again. This is not Morrison's JLA or Whedon's X-MEN; this is not a book that was thought of as running for 50 issues. And still it does what comic book should do, and does it perfectly. It entertains, it makes you laugh, it makes you want to cry, sometimes, and it makes you forget that you're reading a comic book. I can not say anymore to make my point, or maybe I can but I think no one is listening anymore.